assist with further research to find a cure to end stomach cancer (gastric cancer). Cash/Checks/Money Orders/Credit Cards. We are happy to take cash at our events and other functions. Checks and money orders can be mailed to our office, hand delivered to our office, or given to us at events and other functions. Please use our secure online method to donate with your credit card using ACTIVE GIVING or PAYPAL. Just change the amount you wish to donate and choose which format to use. Keep everything else the same. That's it! Activate. 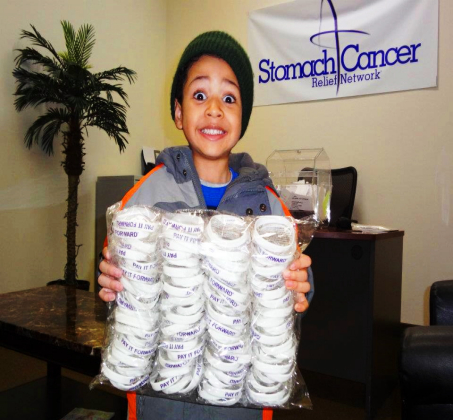 Make all checks and money orders out to Stomach Cancer Relief Network Inc. Gift Cards. Any type of gift card with any amount of funds on them is always appreciated. Gift cards can be mailed to our office, hand delivered to our office, or given to us at events and other functions. In-Kind Donations. At this current time we are accepting the following in kind-donations: office equipment, printing services, silent auction items, meeting spaces, catering, hotel/casino rooms, and legal services. Contact us. In Honor Gifts/Memorial Gifts. For $1,000.00 you can make a donation in honor or in memory of someone. You will be able to post a photo and message to our website for all to see. Just email us at info@scrnet.org with a file attachment after you have made your donation. Thank You. Please Read. If YOU were diagnosed with stomach cancer or any disease, and YOU had to stop working, who would help YOU with your finances??? Having health insurance is great, but it does not cover paying for your bills like your mortgage, rent, utilities, food, transportation, etc. More than likely, YOU will have to turn to YOUR family, friends, co-workers, and the kindness of strangers. Some people will not be able to rely on 1 or more of those options for various reasons, and be forced to rely solely on the kindness of strangers. When we are healthy and working, we don't think much about someone giving us one hundred dollars to help out on our personal expenses when we owe thousands of dollars each month. But when we lose our health and the ability to work, getting that same one hundred dollars now makes a huge difference in our lives. We passionately believe in the good that lies within all of us and the great kindness of charity that the human condition embraces in each of us. Remember if you help just one person, you will have helped many because that person will go on and help others. Thank You!!! Account# 5 0 5 3 4 7 4 1 7 6 Please feel free to make a donation with our account number at any Wells Fargo or Wachovia Banks. Thank You!